One thing is guaranteed to brighten up a standard, nose-to-desk sort of day. The arrival of a new watch. Our postman (for we still have such things in Burford as ‘our’ postie) handed over a package this morning, with his usual grin. Fortunately, I suspect my new arrival would have survived perfectly well. I’d have been a little less relaxed had a vintage Reverso been in the box. See, there are already advantages to F-91 ownership. So, my first watch – ever – to arrive in an Amazon box. Downloadable wristwear. Whatever next? A new watch is always an exciting thing. I was interested to see if the usual frisson was there with my F-91 Antiwatch. And it was. OK, so it’s not the sort of thrill that comes from a unpacking a vintage Explorer or an IWC MkXII, but it’s a thrill all the same. A sort of middle-of-the-road Muscat in comparison with Sauternes, maybe cheaper and less refined, but definitely worth a swig. And I have to say, in spite of my usual watch snobbery that would make Margo Leadbetter (google it if you’re too young) start thinking fondly of low slung jeans and baseball caps, I’m impressed. I like lots of things to read with my watches. I want instructions, guarantees, history, information, service bits and bobs. I like bumf. And the F-91 didn’t let me down. The instruction leaflet was clearly designed by a particularly devious, wizened and ancient origami master at the very top of his game. Although it was tiny, it unfolded to the size of an OS map of Europe. Chaps, don’t bother with wallpaper – it’s cheaper to buy a crateful of F-91s and use the instruction leaflets. Two per wall should do you. I swear it’s even got a section in medieval Catalan. There’s another leaflet – presumably also in Catalan – catchily entitled “Disposal of Waste Electrical and Electronic Equipment of Products for Household use (applicable in the European Union only)” Not quite sure I understand what that means, but I can see it catching on as bedtime reading at Mrs Flangespindler’s Home for the Criminally Insomniac. I couldn’t manage to read any more than the title though. This too is printed on a piece of paper that makes a postage stamp look dangerously large, then folded by Origami San – clearly on a day where he really fancied a challenge. The warranty card was probably in Linear B, but my electron microscope was out of battery by now. 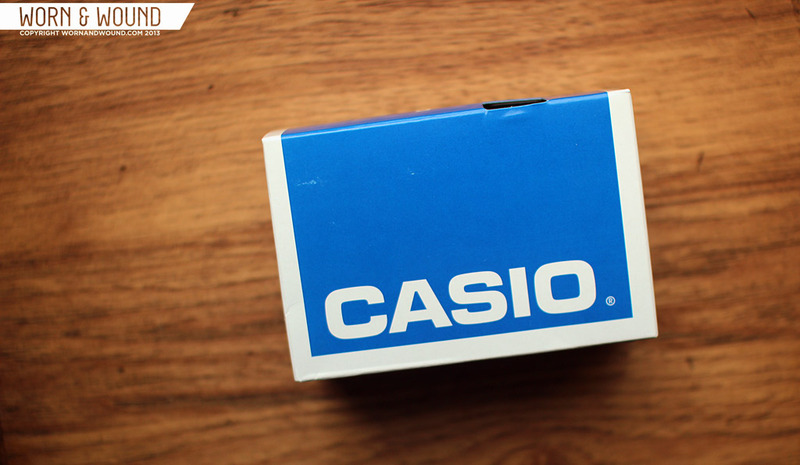 The lovely people at Casio clearly don’t believe in stinting watchbuyers who like a bit of bumf. And 3pt Sanskrit type too. Bit of history of Casio watches would have been good though. But what about the watch? Well, it’s the Toyota Pious of the watchworld; a watch for people who don’t like watches but still need to tell the time. And it does it all beautifully simply. I had it set in under a minute and on my wrist. Once there, you might as well have strapped on a gnat – there’s no weight to its resin case at all. It makes my Timefactors Speedbird III feel like an Olympic discus. Come back next Thursday for Episode 3: The Devil’s Watch?